The theme for February is Much Love in keeping with Valentine’s Day and the bag is denim. Ipsy is a monthly subscription service that is $10 per month. Each month you get a really cute makeup bag with 5 sample sizes of makeup, skincare, and /or haircare products.You can see what I received in past bags here, here, here, here, and here. I have to say I am not terribly excited with my bag this month. Read on to see what I got. NYX Professional Makeup Butter Lipstick in Lifeguard – Right now this satin finish is our goldilocks texture. Glossy is too much. Matte isn’t doing the trick. But this is just right! These are so insanely creamy that there’s no need to use lip balm beforehand. I love, love, love getting lip products. It allows me to try new formulas, new brands, and especially new shades. I like NYX products and this is a gorgeous maroon red. I like the formula and the color so this will almost certainly be in the next Best of the Boxes for February. IBY Beauty Highlighter in Bubbly – The pressed powder is very versatile, whether used as highlighter, shadow, or even dabbed on lips. True to the name, the peachy pink reminds us of champagne, a universally flattering highlighter hue, always. The formula is silky smooth, so any kind of tool (brush, sponge, finger) works with this guy. You will use it and glow glow glow glow glow. This looks like it may be a nice highlighter but how many highlighters does 1 person really need? MOR Rosa Noir Hand & Body Milk – It does exactly what a good hand cream should do: hydrate (using shea butter and macadamia oil), without leaving hands so slippery or greasy that you can’t do anything. The intoxicating scent (a gorg blend of wild rose, hibiscus, and fig) is so good, you can skip perfume. Really. I am a huge fan of hand cream and use it religiously. I was very excited to get this. I don’t love the scent and it is no better than ok as a hand lotion. I’ll use it because I use a lot of hand cream and smaller sizes are great for my purse or work. Elizabeth Mott Whatup Beaches Matte Bronzer – Matte bronzers ALWAYS look more natural than their shimmery counterparts, so there’s that. No Oompa-Loompa orange here, just a neutral brown shade that mimics a “Yeah, I was just in St. Tropez” tan. Creamy and blendable, this powder feels soft and silky, not dry and chalky like other matte formulas often can (you know what we’re talking about). I love a matte bronze but again how many bronzers does 1 person need? This is such a tiny sample that it is basically worthless. It is impossible to get a decent amount of product on a brush because it is so freaking small. I mean like size of a quarter small! Luxie Beauty Luxie Rose Gold Blush Brush 514 – The bristles are vegan, synthetic, and cruelty-free. Soft and fluffy bristles combined with the small domed shape make this great for dusting on highlighter. I love getting brushes in my bags and boxes too so I am happy to get this to try. I have several of their eye brushes that came in Boxycharm October 2016 and I really like this brand. I have a couple of highlighter brushes that I love but I will find use for this one. This bag isn’t a total bust because I really like the lipstick.The highlighter and hand cream are both ok and I haven’t had a chance to try the brush yet. The bronzer sample is just too tiny to even use it. I do have to say that I don’t like the actual bag at all. For February I would have expected something pink or red or with hearts. It is an ugly little bag and I hope next month is better. Do you subscribe to Ipsy? Do you like the service? What did you get this month? Do you like (or not) any of the items I received? That brush looks awesome! Great post ! I haven’t tried it yet but it feels kind of flimsy. I’m not sure how it’s going to fit into my brush collection. 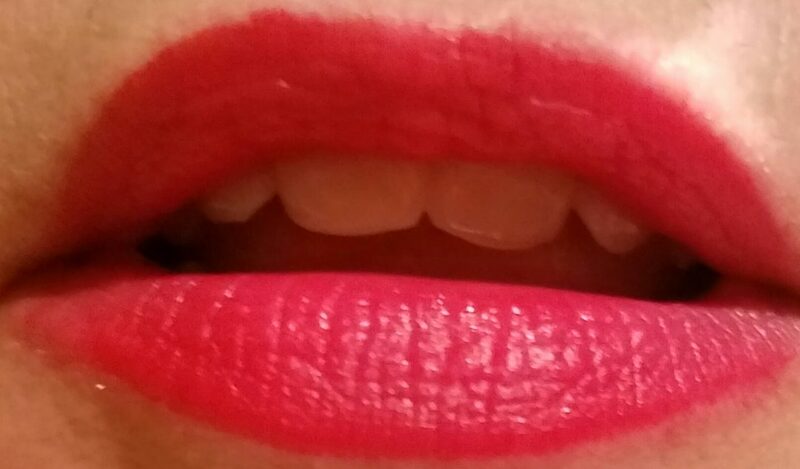 I love the Liquid Suede but this is my first lipstick and it is so anazing. Yes, they are so good!